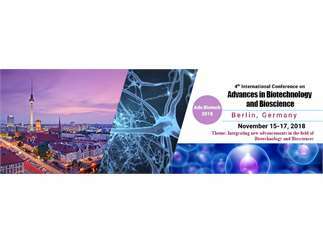 Biotechnology International Conferences invites all the participants from all over the world to attend 4th International Conference on Advances in Biotechnology and Bioscience during November 15-17, 2018 at Berlin, Germany which includes prompt keynote presentations, Oral Talks, Poster Presentations, and Exhibitions. Biotechnology is a field which interrelates biological sciences with engineering technologies to increase living organisms and biological systems to produce products. Bioscience is defined as technologies that relate to therapeutic or diagnostic products or services, including medical devices and digital health technologies that improve human health.